Classic meals made with only six ingredients Think it takes more than a handful of ingredients to get a hearty chicken soup, Sunday dinner--worthy roast beef, or robustly flavored spaghetti and meatballs on the table? Think again. The test cooks at America's Test Kitchen tackled a new challenge in this collection of 175+ fuss-free recipes that slash the shopping list but deliver the big flavor yo… u'd expect. 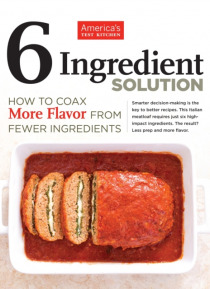 In The Six-Ingredient Solution, we put our ingredients to work and revamped the cooking methods for everything from starters and soups to braises, casseroles, pastas, and desserts--without losing any flavor.